Home-Cooked & Handmade: I Made it Through the Ultimate Blog Challenge! Just like that, October is gone! And I did it! 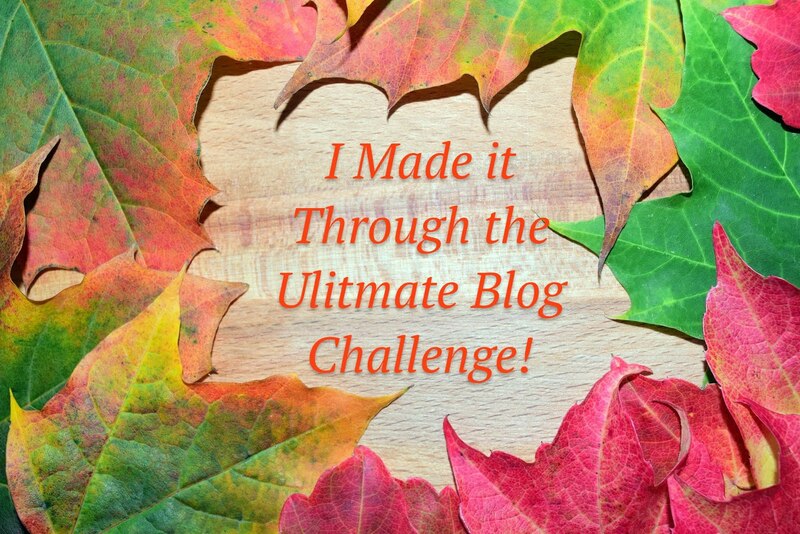 I made it through the Ultimate Blog Challenge with 31 posts in 31 days. Yeah! I thought I might quit for a second there. With one late post and another just barely squeaked in on time on the 20th I stared to lose hope and ideas! But then the juices started to flow and I was renewed. I made it through these 31 days and I'm so pleased! I didn't think I would use any of the prompts provided by Paul Taubman, but the question and answer idea was the perfect fog-lifter to set me back on track. You all asked me such great questions. Thank you for interacting. Thank you for your feedback yesterday. I'm going to try one tip that someone suggested. Tell me in the comments below if you can figure it out! It was good to hear that my site is easy to navigate. I try to make it that way, but I know sometimes what seems easy to one may be difficult to another. Thank you also for the suggestion to join Wordpress. I have another blogger friend who really enjoys using that platform. I am not one who loves change but I will definitely think on it! I will be starting a new blog this upcoming January, chronicling personal growth. I will consider WordPress for this even though I've already started prepping in Blogger. Lastly, I will try to add more content regularly and continue work on things to make this site as user-friendly as possible. It's good to see you made it through too. It's been a long haul, hasn't it? But I'm glad I did it. It gave me renewed energy to blog more consistently again. Hope I keep seeing you on Twitter. I've enjoyed meeting you here. WOO HOO, Congrats on completing the challenge! For me it started out slow, a little struggling but I quickly regrouped and completed a blog each day. I love how the bloggers help everyone out with views and comments, we're like a little family on UBC. My goal now that the challenge is over, is to write at least once, if not twice a week to keep my readers interested. Looking forward to your home-cooked and handmade ideas you share! Congratulations on completing the challenge! I enjoyed your posts. I'm glad that you didn't give up on it. I understand how challenging it can be when life gets busy.